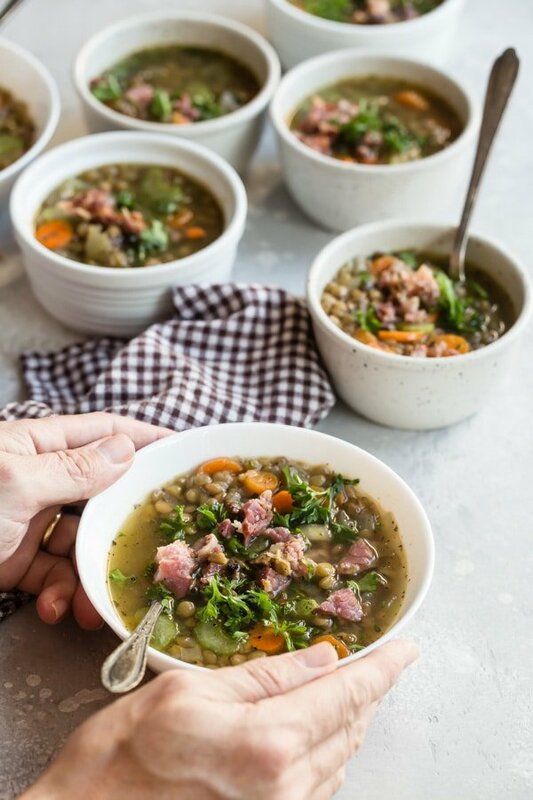 This Ham and Lentil Soup recipe is perfect for chilly weather and cooks up in about an hour; all you need is a loaf of French bread for a cozy winter’s feast. Put your leftover ham to work and make it on the stove, in a pressure cooker, or in your crockpot! 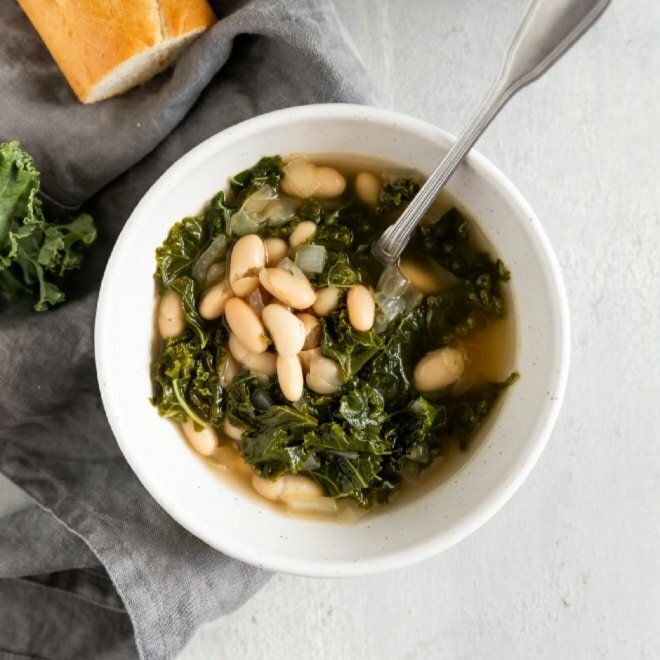 Soup has many superpowers: it warms us up, helps heal us when we are sick, and soothes the savage beast when we’re crabby with hunger. Maybe that’s why so many people insist that they can’t make a decent soup, because it’s too tall an order to make something that is so good for you, and that can do so much. Maybe that’s why the grocery shelves are stocked with so many cans of soup, none of which hold a candle to the real thing: made-from-scratch hambone lentil soup. 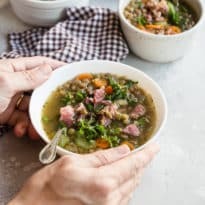 Well, I’m here to tell you that it’s totally, completely possible to make a delicious homemade soup with little more than a smoked ham hock and some lentils. If you make this lentil soup recipe, you’ll probably never buy another can of soup again. It’s that good. I’ve always believed that the best soup in the world is the one you make yourself with basic ingredients. 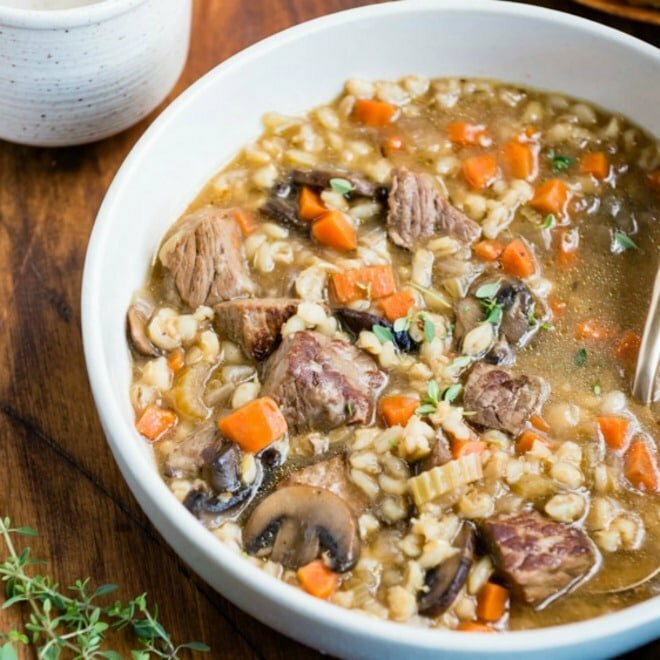 If you’ve got lentils in the pantry and a leftover hambone from the holidays, put it to work in this simple, completely satisfying soup. 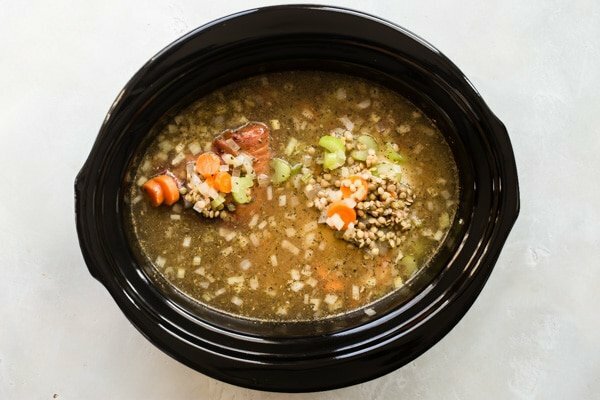 This ham bone and lentil soup is perfect for the stove, the pressure cooker, or the crockpot, depending on what you want to use. All the instructions are included down below in the recipe. Making an extra large pot for a soup exchange or your neighbor with a cold? Click and slide the number next to “servings” on the recipe card below to adjust the ingredients to match how many you’re feeding—the recipe does the math for you, it’s that easy. Where can I find a ham bone? If you don’t have a leftover ham bone from the holidays, go to your butcher and ask for a smoked ham hock or a ham shank. A ham hock may be a little less meaty, but it will work just fine and still give the soup incredible flavor. Technically, the hock is the end of a smoked ham where the foot was attached to the hog’s leg. You could also ask for a ham shank. The shank is from a lower portion of the leg, therefore it’s meatier than the hock. What kind of lentils for hambone soup? I recommend any variety of whole lentil for this recipe. Look for a green or brown lentil for making ham and lentil soup. Red and yellow split lentils will break down into mush, and won’t add any texture to the soup. How do you cook lentils? Compared to other dried legumes, lentils are easy to prepare. 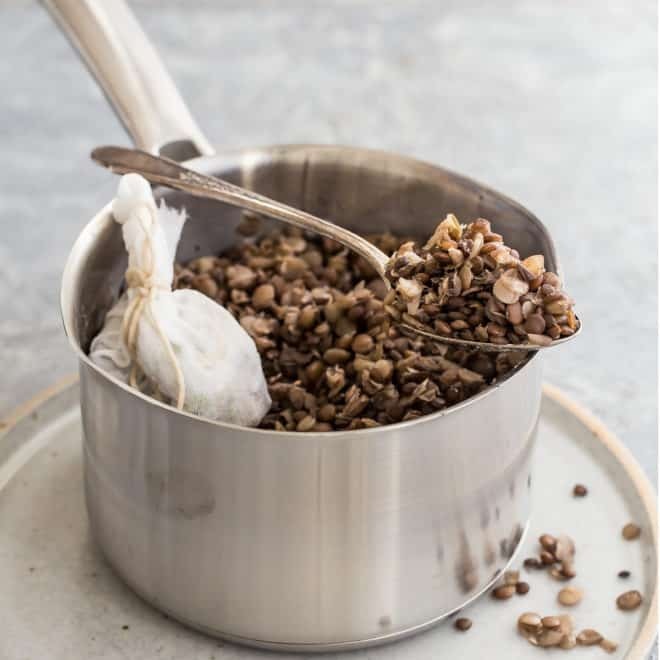 There is no need to presoak lentils, and they take much less time to cook than chickpeas or beans. 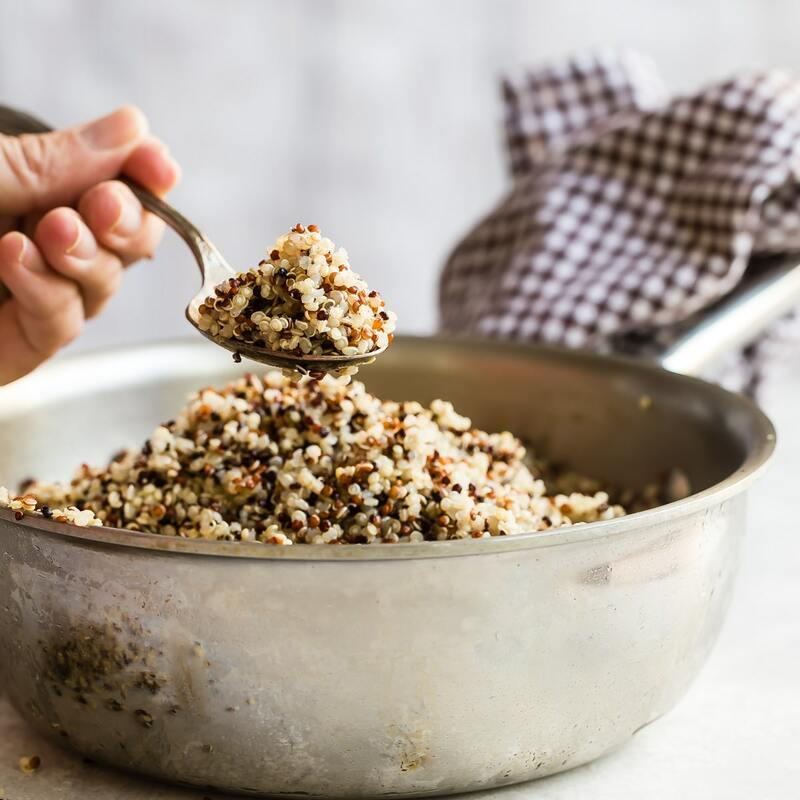 I’ve written a how-to about lentils, if you care to explore this easygoing member of the pulse family; I love adding cooked lentils to almost everything! 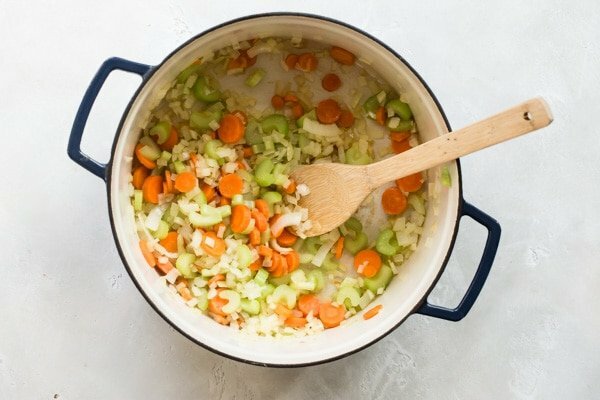 For making hambone and lentil soup, cooking lentils is just a matter of adding the rinsed lentils to the cooking liquid and simmering until they’re tender. 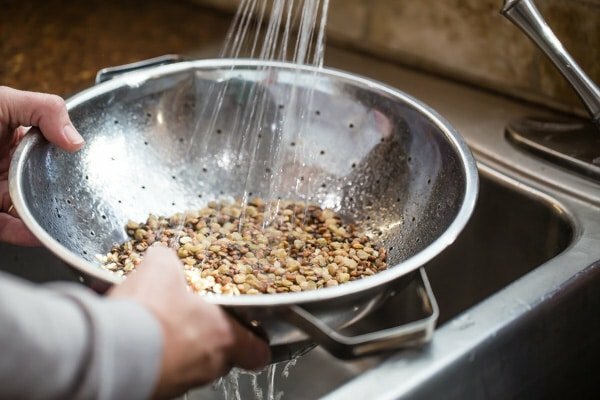 Pre-rinsing is super important, to remove any dust or grit, and to get rid of any pebbles that may have snuck in with the lentils. On the stovetop, in the crockpot, or in a modern pressure cooker, I’ve got you covered! Keep reading. Heat olive oil in the Dutch oven over medium-high heat until shimmering. Next, sauté carrots, celery, and onion until softened, about 5 minutes. Stir in the broth, water, lentils, ham bone, spices, and bay leaf. Bring to a boil then simmer for 45 minutes, until lentils and ham are tender. When the lentils are cooked, remove the hambone and the bay leaf. Cut the extra ham off of the bone, chop it up, and return it to the pot along with any additional ham you might be using. 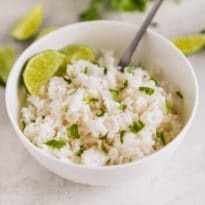 Finally, season the soup to your taste with salt and pepper and garnish with parsley, if desired. Heat olive oil in a pan or Dutch oven over medium-high heat until shimmering. Stir in broth, water, lentils, ham bone, spices, and bay leaf. Bring to a boil. Pour into slow cooker and cook on HIGH setting for 3 to 4 hours, or LOW for 6 to 8 hours. Using the sauté function on your Instant Pot, heat olive oil until shimmering. Sauté carrots, celery, and onion until softened and translucent, about 5 minutes. Next, stir in broth, water, lentils, ham bone, spices, and bay leaf. Secure the lid, close the pressure valve, and cook at high pressure for 35 minutes. Allow the pressure to release naturally. Remove ham bone and bay leaf. 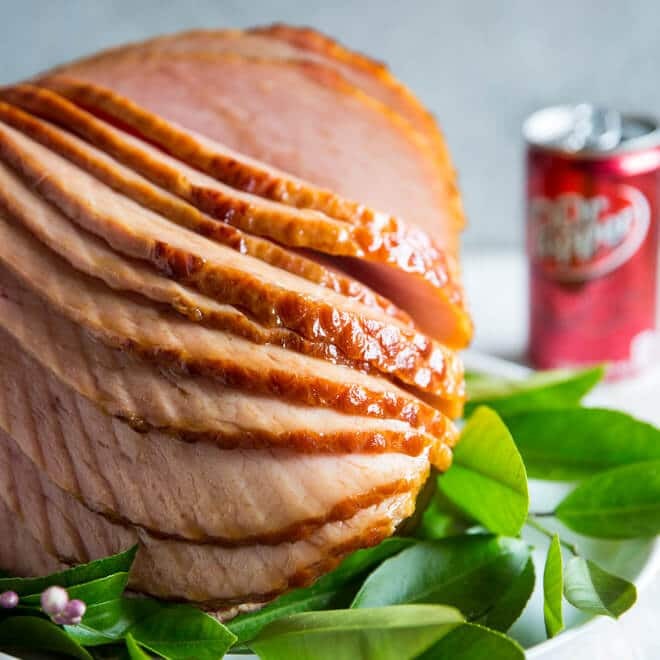 Chop ham from bone and return to Instant Pot, along with any extra ham you might be using. Season to taste with salt and pepper and garnish with parsley if desired. 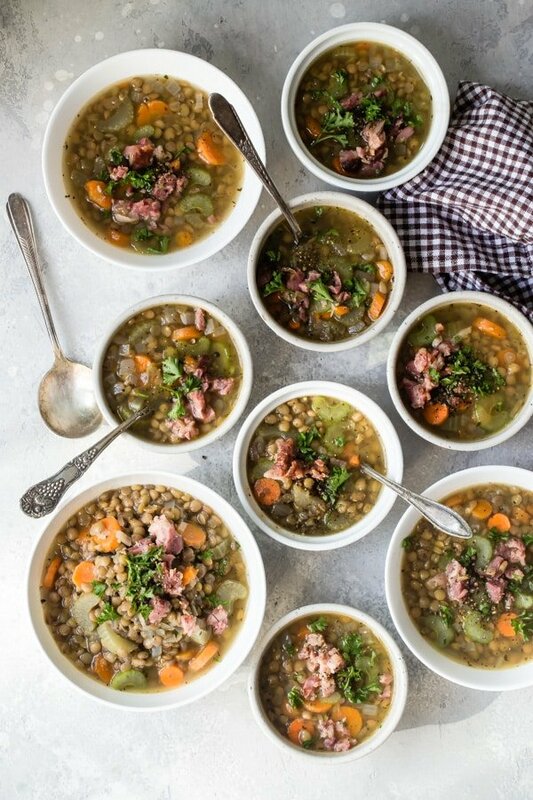 Can you freeze Ham and Lentil Soup? Since the leftovers are even better the next day, make a big double batch or make the soup a day in advance. And yes, you can freeze the lentil soup in portions for another meal when time is short. In a 3-quart saucepan or Dutch oven, heat olive oil over medium-high heat until shimmering. Sauté carrots, celery, and onion until softened and translucent, about 5 minutes. Stir in broth, water, lentils, ham bone, garlic powder, cumin, paprika, thyme, and bay leaf. Bring to a boil. Simmer until lentils are tender, 45 minutes to 1 hour. Remove ham bone and bay leaf. Chop ham from bone and return to pot. Add additional leftover ham, if using, and cover until heated through, about 5 minutes. Season to taste with salt and pepper and garnish with parsley if desired. In a 3-quart pan or Dutch oven, heat olive oil over medium-high heat until shimmering. Sauté carrots, celery, and onion until softened and translucent, about 5 minutes. Stir in broth, water, lentils, ham bone, garlic powder, cumin, paprika, thyme, and bay leaf. Bring to a boil. Pour into slow cooker. Heat on HIGH for 3 to 4 hours, LOW for 6 to 8 hours, or until lentils are tender. Remove ham bone and bay leaf. Chop ham from bone and return to slow cooker. Add additional leftover ham, if using, and cover until heated through, about 5 minutes. Season to taste with salt and pepper and garnish with parsley if desired. Press the Sauté button on your Instant Pot and heat olive oil until shimmering. Sauté carrots, celery, and onion until softened and translucent, about 5 minutes. Stir in broth, water, lentils, ham bone, garlic powder, cumin, paprika, thyme, and bay leaf. Secure the lid, close the pressure valve, and cook at high pressure for 35 minutes. Allow the pressure to release naturally. Remove ham bone and bay leaf. 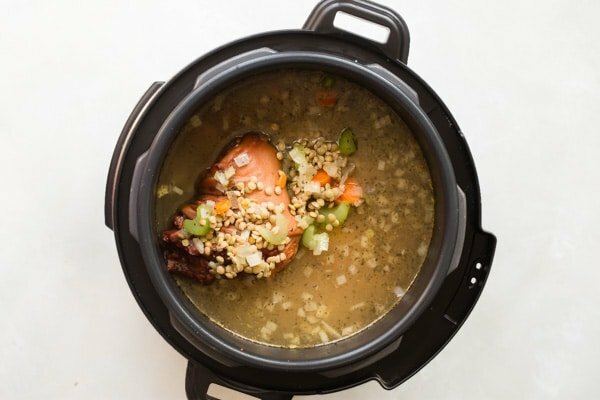 Chop ham from bone and return to Instant Pot. 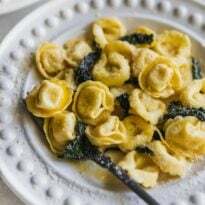 Season to taste with salt and pepper and garnish with parsley if desired.